The Hocking County Chapter of the Ohio Retired Teachers Association was organized on October 9, 1969. Ethel Guthrie, District III Director for Ohio Retired Teachers Association, came to Logan on October 9, 1969 for the organizational meeting. The meeting was held at Brandt's Restaurant at 2 p.m. Ms. Guthrie and Mr. Ralph Walker worked together in this organization of the Hocking County Chapter RTA. 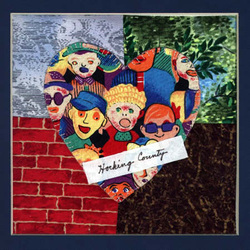 On the Hocking County quilt blocks, the background fabrics in the desginated block are representative of the Hocking County area. The blue in the upper left represents the sky and reflective water. Visitors to Hocking County find numerous fishing and wildlife viewing areas. The green foliage is representative of the beautiful vegetation found in our numerous State Parks. Hocking County has long been rich in the heritage of clay and brick making. Clay sewer tile is shipped all over the world for use in major cities. Recently, these items have found a new venue in the area of decorative garden art. The brown fabric represents the wonderful hiking trails found in our State Parks. These have been preserved for generations and attract a variety of visitors to our area. The Heart constructed from a Kids print symbolized the Heart of the Child. As retired teachers it is most appropriate that we recall the focus of so many years of service.